Product categories of Multi-functional Highway Guardrail Pile Driver, we are specialized manufacturers from China, Multi-Functional Highway Guardrail Pile Driver, Drop Hammer Pile Driver suppliers/factory, wholesale high-quality products of Pile Drilling Hammer R & D and manufacturing, we have the perfect after-sales service and technical support. Look forward to your cooperation! Hydraulic Pile Drivers for Highway Guardrail are a new model for installation and maintenance of highway anti-collision guardrails and traffic barriers. They have the characters of accurate hole positioning, small size, lightweight, quick movement, easy operation, strong engine power, low fuel consumption, reliable braking performance, aesthetic appearance, spacious comfortable interior and wide vision, high efficiency and especially applicable for driving the guardrail post in newly constructing highways. 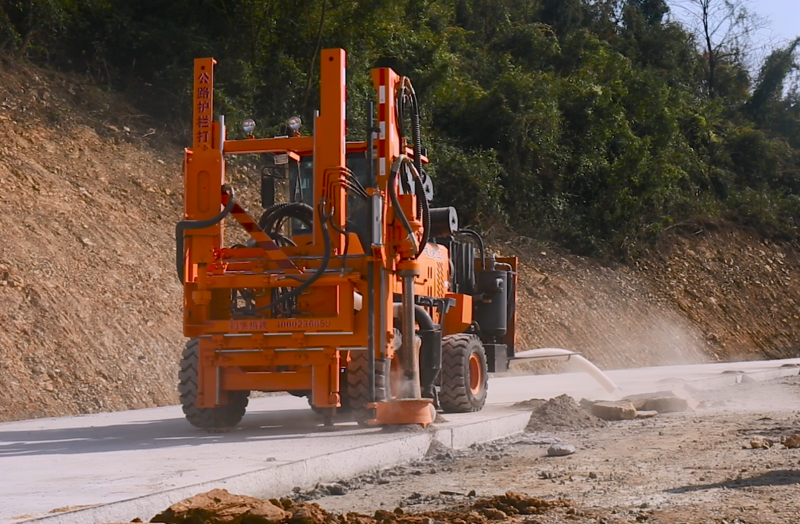 Off-road chassis have had post driving, extracting and drilling equipped made by HongGong, especially suitable for mountain and rough road construction. We can also modify according to customer's different requirement.